Find out if Meineke is the right franchise for you! Fill out the form below to download a comprehensive kit. An experienced member of our franchise team will contact you with more details. After reviewing the information we have presented, you may still have questions. Meineke Car Care Centers is a growing group of auto repair franchise. These are some of the most common questions we answer for our potential franchisees. If you have additional questions, a team member is more than happy to answer them at your convenience. Q: Are franchisees required to have an automotive or mechanical background? A: No. In fact, most do not. Our franchisees come from diverse professional backgrounds, which is what makes our brand so unique. Meineke provides a first class, two and a half week training program that teaches the skills needed to run a successful automotive franchise. Q: How much cash is required for opening? Is financing available? A: The total estimated initial investment for a leased Meineke location ranges from $123,121 to $572,411.94. However, the type of opening and how many auto franchise centers you are opening will determine the amount of cash required for funding. Typically, Small Business Administration (SBA) loans require a 30% cash injection. Rest assured, there are a variety of financial opportunities and considerations that may be available to you. Assuming that you have approvable credit, Meineke will provide you with a finance manager who will assist you in the loan/lending process. Q: May I own multiple Meineke automotive franchises? A: For the qualified franchisee candidate, this is opportunity is absolutely available. Meineke offers incredible incentives for those individuals who are looking to be a Multi Shop Operator. Q: Will Meineke provide assistance for real estate selection? A: Meineke has both in-house and field-based employees, as well as a network of real estate brokers, who assist franchisees in real estate selection and the development process of their automotive franchise. Q: Does Meineke provide franchisee with a protected territory? A: Unlike our competition, Meineke provides exclusive car repair business territory protections. This means when you are granted a specific location, no franchise will infringe on your territory. Q: What automotive service does a Meineke Car Care Franchise offer? 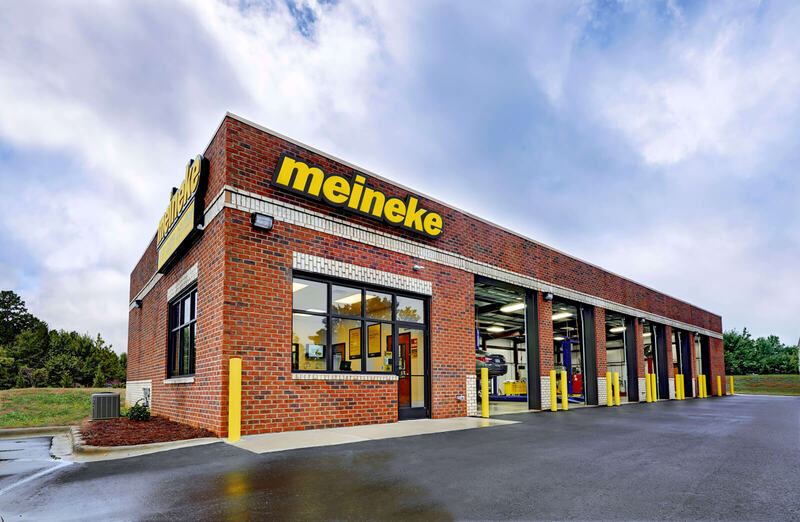 A: Meineke is a one-stop, automotive franchise shop that offers a wide variety of services to customers. Through constant research of car care products and the car repair market, Meineke assists franchisees in maximizing earning potential through service, repair and products. Q: Does Meineke offer an advertising program? A: Meineke offers a comprehensive advertising and marketing program. With a multi-million dollar advertising fund, Meineke arranges for national and local television placements, local search marketing and local print ads. Additionally, Meineke provides direct mailings to all existing customers on a monthly basis. This is made available to franchisees by the contributions made to the Meineke Advertising Fund (MAF). Meineke has the in-house capability to assist with any creative work needed at no additional charge to our franchise owners. Q: What ongoing training and support does Meineke provide? A: Additionally, Meineke has an extensive Dealer Access website that contains the automotive franchise’s operations manual, an interactive forum and up-to-date, informative publications. Recently, an online business-planning tool has also been added to help franchisees understand weaknesses in financial or operational performance through benchmarking and provides specific action plans to remedy those weaknesses. A: Store sales vary by location and size. Please see Item 19 of the Franchise Disclosure Document for additional information about financial performance of our stores. Q: Do I have to buy inventory from Meineke? A: No. Meineke affords you the opportunity to purchase inventory from a variety of approved suppliers, which can provide you with significant purchasing advantages. Q: What qualifications are needed to become a Meineke Automotive franchise owner? A: Please click here and fill out our franchise application and to speak to a franchise representative. Q: What is the typical lifestyle of a Meineke franchisee? A: The Meineke system affords its franchisees the opportunity to be their own boss in an auto parts franchise they own. The Meineke business gives its franchisees the opportunity to build their business around their personal lives, with little to no outside travel necessary. We want you to have leisure time to spend with your family and friends. Because you will be the boss in your own business, you have the opportunity of building equity, which can pave the way for financial freedom. Q: What are the next steps to becoming part of the Meineke auto repair franchise? A: Call our toll-free number 888-918-4522 to speak with a representative or click here to submit an online application. A representative from our Franchise Development Team will contact you to begin your journey toward auto service franchise success. Contact us today to get any of your remaining questions answered concerning opening your own Meineke Car Care Center. Our corporate headquarters are in Charlotte, North Carolina, but we have locations both nationally and internationally. Welcome to the resources section of our website. Here you’ll find articles, tips, and other helpful information about running a complete car care franchise with Meineke. "After three decades in a single industry, I thought I was pigeonholed to a career in telecommunications, but I realized that those years created skill sets that were completely transferable to a different career opportunity. I grew up around cars with a grandfather who owned a Ford dealership, and it really developed my love for automotive. Meineke has allowed me to combine a passion and a skill set and channel that into a dream career. Now Arkansas has an automotive repair option that they can trust."